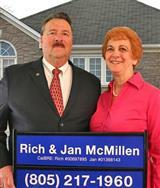 RICH & JAN McMillen are top producing REALTORS® with almost 30 years Conejo Valley real estate experience. Their aggressive Home Marketing Program translates into consistent multi-million dollar production levels with plenty of satisfied customers and referrals. "Our only goal is to provide exceptional and quality service to our clients," says Rich. "We have won several real estate awards, but a single referral from a satisfied customer far outweighs any production trophy." The real estate market is dynamic and RICH & JAN take classes and attend seminars beyond those mandated by the state in order to continue best serving their clients' needs. In that vein, the McMillens have obtained the Graduate REALTOR® Institute (GRI) and Real Estate Technology (e-Pro) designations from the National Association of REALTORS® and completed training for Senior Real Estate Specialist (SRES) and Accredited Staging Professional designations. Rich has also course work for CRS (Council of Residential Specialists) requirements.